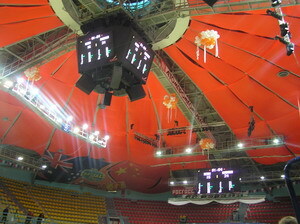 The most advanced super-modern technical equipment of the main arena of the Palace of sports game , no doubt, can be a source of pride for the Urals and the envy of many nations recognized sports . 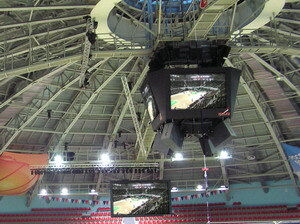 Multifunctional media cube, mounted under the dome game room, and side LED board open vast opportunities for informing fans during the competition from various demonstration videos to show interesting points of the game in slow mode and repeat. Perfect information carrier is also an electronic scoreboard , installed along the playing field. Professional television system allows to live broadcasts from competitions on any channel in the world. A “star” of Russian and foreign show business have already managed to appreciate the quality concert sound and lighting equipment in the room. 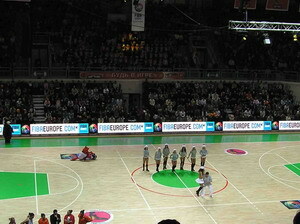 Naturally, sports competitions and important high-level presence befitting sports equipment. In this section the event organizers can find a list of such along with concert sound and lighting equipment . – Signaling Devices 2 pcs. Speaker System Line Array ( 90 ?) , Three-way \ biamp (LF 1000 \ 2800 W , 8 Ohm HF : 225 \ 900 watts into 8 ohms ) 28 kg , manufactured by JBL, type VT4887, count 20 pcs . Low-frequency speaker system (subwoofer 2400W \ 4 ohms ) , manufactured by JBL, type VT4881, count of 10 pieces . Power amplifier (stereo, 2250 W \ 4 ohms ) , the production of MS 2, type E 45 , count 10 pcs . Dynamic vocal microphone , manufactured by the company Shure, type SM58S, count 8 pcs. Dynamic microphone , manufactured by the company Shure, type Beta 57A, count 4 pcs. Dynamic microphone , manufactured by the company Shure, type Beta 58A, count 2 pcs. Instrument Microphone , manufactured by the company Shure, type SM81, count 2 pcs. Instrument Microphone , manufactured by the company Shure, type Beta87, count 2 pcs. Dynamic microphone bass , made in company AKG, type D112, count 2 pcs. Microphone ” clothespin ” for Strings , made in company AKG, S411 , count 4 pcs. Microphone ” clip ” for percussion , made in company AKG, G418 , count 8 pcs. Microphone ” clip ” for wind instruments , manufactured by the company AKG, S419 , count 4 pcs. Professional two-channel “vocal” radio series ULX with 2 microphones SM58, made ​​in the company Shure, type ULXP24D \ 58, count 2 pcs. Professional two-channel ” instrumental ” radio series ULX c with 2 portable transmitters ULX1, made ​​in the company Shure, type ULXP14D, count 2 pcs. Condenser vocal microphone headset for radio , manufactured by the company Shure, type WSM16, count 4 pcs. Microphone stand ( round base ) , manufactured by the company Proel, type RSM150, count of 10 pieces . Front Microphone ” crane” , low , made in company Proel, type RSM171, Quantity 5 pcs. A mixing console ( 40 channels mono + 4 stereo \ 8 \ 2 + Matrix ) , manufactured by the company Soundcraft, type RW5697SM, Qty 1 pcs . Front under control , count 1 pc. Controller , manufactured by the company Klark Teknik, type DN9848, Qty 1 pcs . 2-channel FBX, EQ, compressor , delay , made in the company Sabine, type GRQ- 3102 Quantity 2 pcs. 4-channel compressor \ limiter , made in company DBX, type 1046 -EU, count 2 pcs. 4-channel expander \ gate with Key- in filters , manufactured by the company DBX, type 1074 -EU, count 2 pcs. Digital reverb , manufactured by TC Electronic, type D-Two, count 1 pc. CD / cassette , manufactured by the company TASCAM, type CD-A700, count 2 pcs. Minidisc recorder , manufactured by the company TASCAM, type MD350, count 2 pcs. Closed head phones , manufactured by the company Sony, MDR- 7506 type , count 2 pcs. A mixing console monitor (40 mono inputs ) , production in the company Spirit by Soundcraft, type 2 Monitor , Qty 1 pcs . Splitter12h48 active microphone , manufactured by the company Klark Teknik, type DN1248Plus, count 2 pcs. Active DJ splitter 14×14 , made in company Klark Teknik, type DN1414, Qty 1 pcs . Crossover , manufactured by the company DBX, type 223XL-EU, Qty 1 pcs . Graphic Equalizer , manufactured by the company Klark Teknik, type DN360, count 4 pcs. Monitors Floor 800 W / 8 ohms , made in the company JBL, type SRX712M, count of 12 pcs. Monitors side 1200W / 4 ohms, ” backache ” , manufactured by the company JBL, type SRX725, count 2 pcs. Subwoofer ( 1200 W / 4 Ohms) , manufactured by the company JBL, type SRX728S, count 2 pcs. Power amplifier (stereo, 2250 W / 4 Ohms) , manufactured by the company MS 2, type E 45 , Qty 1 pcs . Power amplifier , manufactured by the company MS 2, type E 25 , number 7 pcs. Drum set with a set of racks , Set «Standard», made ​​in company Yamaha, type SCA-2F5RB, Qty 1 pcs . Chair for the drummer , made in company K & M, type 14016.000.55 , Qty 1 pcs . For folding chair , made in company K & M, type 14043.000.55 , Qty 1 pcs . Stands for keyboard bunk , made in company Proel, type SPL152, count 2 pcs. Tube guitar combo , made in the company Fender, type Twin Reverb, Qty 1 pcs . Basgitarny combo , made in the company Fender, Bassman 400 type , Qty 1 pcs . Amp rack , manufactured by the company Proel, type EL700, count 2 pcs. Device PAR 64 220V 1000W, black , made in company FAL, type PF2009, Quantity 120 pcs . Lamp 1000W CP61, made ​​in the company GE, type SR61 , Quantity 140 pcs . Spotlight profile SOURCE FOUR ZOOM 25-50 gr. lamp HPL, made ​​in the company ETC 7060A1242 – type OX Quantity 4 pcs. 575 W halogen lamp , socket G9, 5 , 575 HPL type , quantity 6 pcs. Device ColorWash 1200 E AT, made ​​in company Robe, type ColorWash 1200 E AT, count 6 pcs. Lamp MSR 1200 SA, made ​​in the company Philips, type MSR 1200 SA, count 7 pcs. Device Color Sport 1200 AT, made ​​in company Robe, type Color Sport 1200 AT, count 6 pcs. Scanner Scan 1200 XT, the company made ​​in Robe, type Scan 1200 XT, count 6 pcs. Spotlight tracking light OPERA MMD 2500 . Iraidalnaya aperture , zoom 4.5-9.5 g. , Profiling, blackout , focus, change filters , base G 38 lamp HMI2500W/SE, remote ballast , manufactured by the company FAL, type PF 1182 count in 2 pieces . Tripod , manufactured by the company FAL, type PF 318 Quantity 2 pcs. Lamp HMI 2500 W / SE, made ​​in the company OSRAM, the type of HMI 2500 W / SE, count 4 pcs. 1500W strobe , dimming and frequency of outbreaks , control DMX512, complete with lamp , manufactured by the company FAL, type PF6020, count 4 pcs. UV lamp with ballast, socket E40 , complete with lamp BULBO 400 W , manufactured by the company FAL, type PF 164 , number 4 pcs.